Metro: None, maybe Spagna. An alternate is to take Bus 40 or 64 (get off at Largo di Torre Argentina, then walk north from there). Hours: Monday - Saturday 8:30 AM - 6:30 PM, Sunday 9:00 AM - 6:00 PM, sometimes closed for Mass. Exterior visible at any time, and well-lit at night. 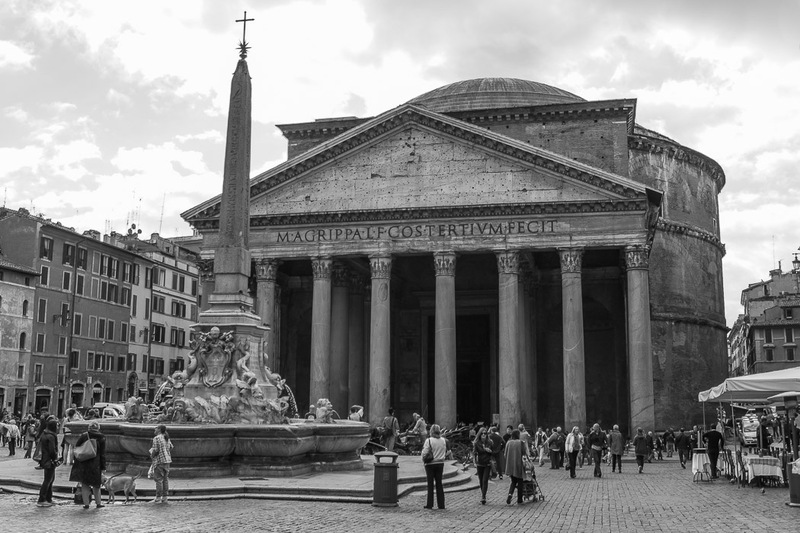 The Pantheon is the best preserved Roman building in the world. Although the exterior of the building is not really that fancy, and the inside doesn't look at all ancient, realize when you're looking at this building that you're looking at a complete building passed down from 2000 years ago with no missing walls, no 20th century guesses at where the columns on the porch might have been placed, and no attempt to cover up the flaws. This is the real thing, largely owing to the fact that the building has been in constant use since ancient times (also explaining the much more modern look of the interior). 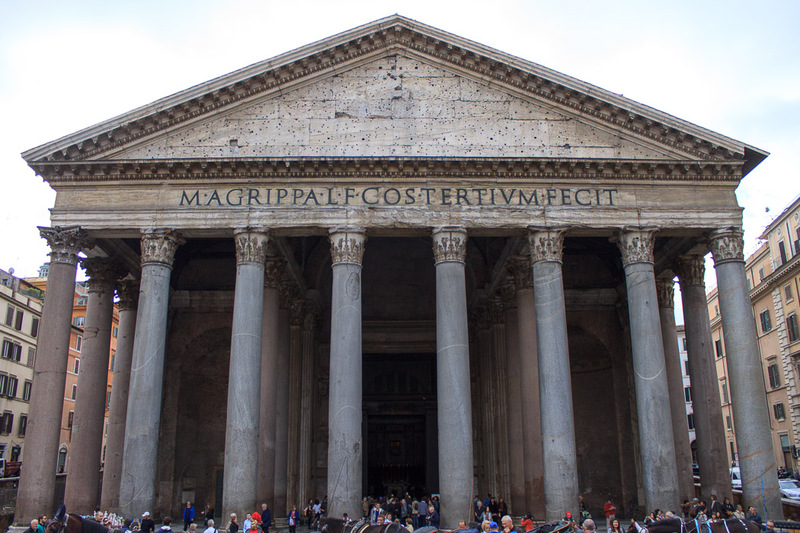 The Pantheon was originally built, in the aftermath of the Battle of Actium of 31 BC, in 27 BC by Augustus' right-hand man Marcus Vispanius Agrippa, and was a temple dedicated to all the gods of Rome. Historically, it is known that there were large sculptures of Mars, Venus, Julius Caesar and Augustus inside, perhaps skewing the intent of the temple for political purposes. It was long thought, mainly due to the inscription to M. Agrippa on the building, that the building we see today was this building of 27 BC, but that is not the case. Late 19th century excavations concluded that Agrippa's original building was south-facing (in contrast to today's north-facing building) and was either rectangular or T-shaped, but in the late 20th century, further excavations suggest it was round, with a triangular porch, and that it faced north as does today's Pantheon. In any case, the Pantheon built by Agrippa burned in 80 AD, was rebuilt by Domitian, but burned again in 110 AD after a lightening strike. In the superstitious nature of the culture, it is impossible to suggest that the Romans did not take these two events as a sign of some inherent divine unhappiness, perhaps due to the tainted tribute to the gods resulting from the inclusion of the still-living (at the time of construction) emperor Augustus. Trajan's architect, Apollodorus of Damascus, designed the replacement Pantheon, and it was built under Hadrian in about 126 AD. Part of Hadrian's objective in his complete reconstruction and redesigning of the Pantheon might well have been to avoid the mistakes of Agrippa in including a political agenda for the temple. This is the building we see today, which is a round building (rotunda) with a round dome for a roof and a rectangular porch as its entrance on the north end. The porch has a Greek style, since Hadrian was fond of everything Greek. A rectangular vestibule links the porch to the rotunda. The porch has sixteen massive granite Corinthian columns (eight in the front row, and two groups of four behinde each side of the front row), supporting an elegantly-designed triangular stone pediment. 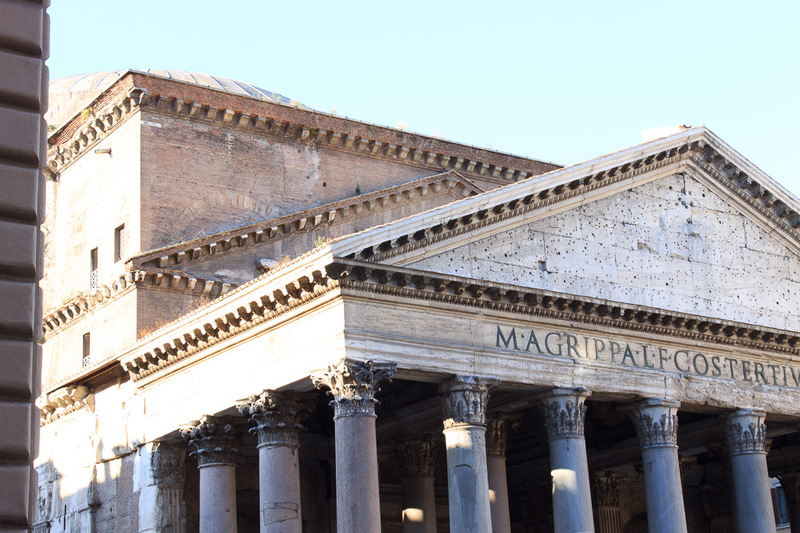 The inscription above the porch acknowledges Agrippa's original achievement, saying "Marcus Agrippa, son of Lucius, made this in his 3rd Consulate", though the inscription actually dates from the time of Hadrian's reconstruction. It was very unusual for a Roman emperor to give credit to someone else for one of his buildings. The pediment was originally decorated with a relief sculpture, probably of gilded bronze. Holes marking the location of clamps that held the sculpture suggest it was likely an eagle within a wreath; ribbons extended from the wreath to the corners of the pediment. The porch was originally designed for columns 50 Roman feet tall and Corinthian capitals 10 Roman feet tall. Instead, columns 40 Roman feet tall were used, possibly due to supply or transport problems (the grey granite columns came from Mons Claudianus in Egypt). This results in the mismatch where the pediment of the porch attaches to the rotunda (1st photo below), and also leads to the slightly-unbalanced appearance of the Pantheon, with its porch too short for its width (2nd photo below) and for the rotunda behind it. 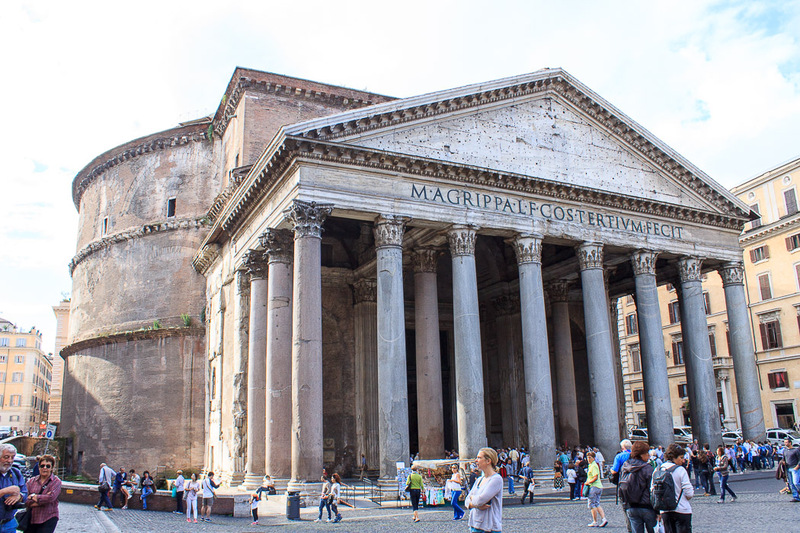 When it was first built, the Pantheon was raised upon a flight of five steps that are now partially buried by the natural rise in ground level. This elevation of the portico would have contributed to the awe that ancient visitors experienced when visiting this impressively large temple. 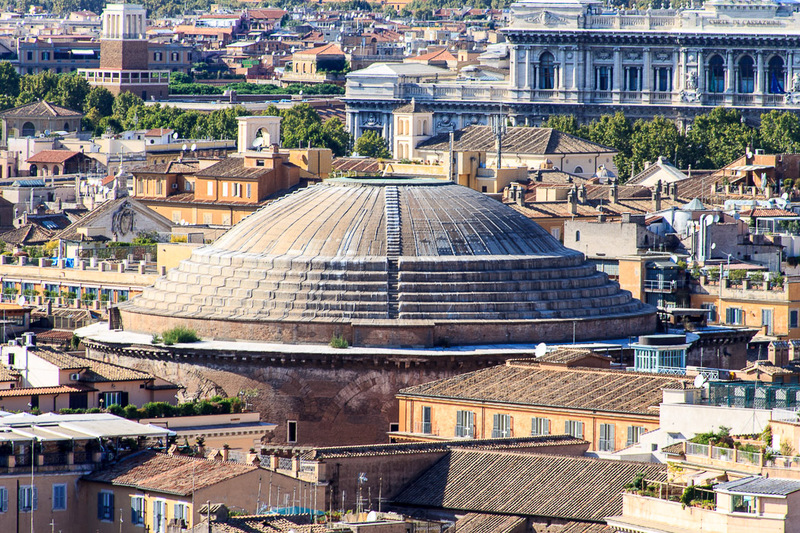 Also, the dome was originally covered in bronze, which would have glowed brightly in the strong sunshine of Rome. The real masterpiece of the Pantheon is the roof, which is a huge, 142-foot concrete dome weighing 5000 tons, only supported by eight barrel vaults (see the brickwork arches in the 3rd photo below) in the 21-foot-thick side walls which are carried into eight piers. 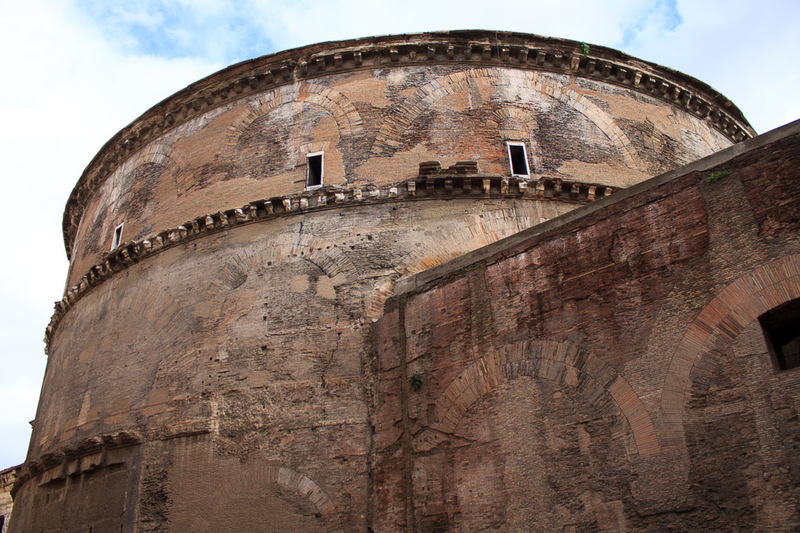 The outer edge of those barrel vaults is easily visible on the exterior of the Pantheon. The dome is a masterpiece of engineering, built in a series of rings of different materials which become lighter and thinner toward the center, and a central 28-foot-wide opening (oculus) which allows natural light from the sky to enter the building (and also allows rain to pour in onto the marble floor and into a drainage system below it). The oculus and the entry doors are the only sources of light for the building. The dome is 21 feet thick at its base, and 4 feet thick around the oculus. It is estimated that if normal concrete had been used for the entire dome, the stresses in the dome would have been 80% greater than they are, however, lighter materials such as small pots or pieces of pumice were used instead of stones in the higher levels of the dome. The interior of the dome is coffered (2nd photo below) with 5 rings of 28 coffers, creating a decorative pattern and vastly reducing its weight. In antiquity, the coffers may have contained bronze stars or rosettes. At the time of its construction, this was easily the largest dome ever built by mankind. 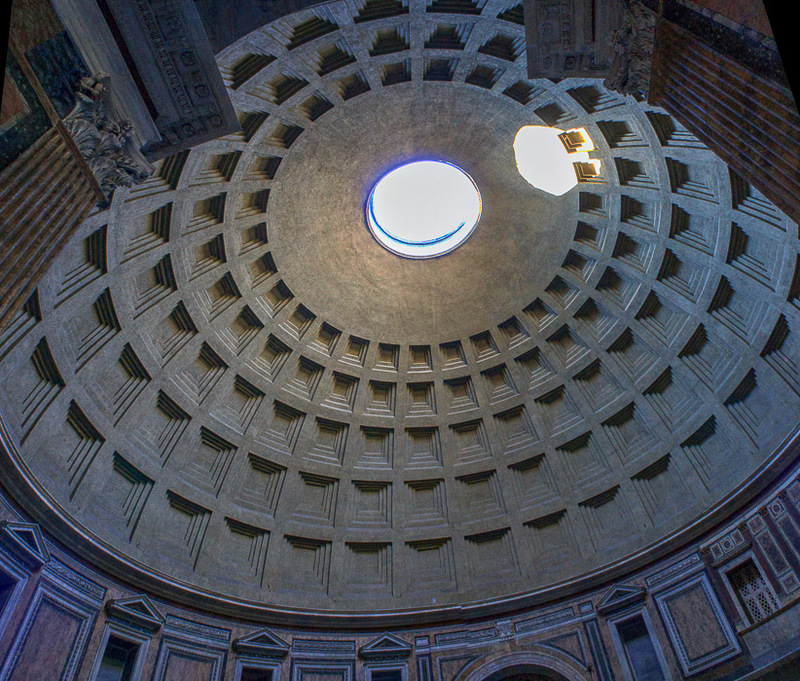 Almost 2000 years after it was built, the Pantheon's dome is still the world's largest unreinforced concrete dome. Both the diameter of the dome and the height of the oculus (measured at the center of the dome as if the oculus was filled-in) are 142 feet, meaning a 142-foot-diameter sphere would fit the interior of the building exactly, touching the floor, walls, and ceiling. That 142 foot measurement makes more sense when expressed as its equivalent 150 Roman feet. The oculus is 30 Roman feet in diameter. Just imagine the shock of an ancient first-time visitor to the Pantheon. From the looks of the front of the temple, the expectation is that the inside will be a rectangular room with a flat roof and a statue of a deity in the center. Instead one enters an enormous spherical room with an impossible unsupported domed ceiling and niches in the outer wall for the statues of all the deities. The oculus in the ceiling lets in the strong Roman sun, making the building into a huge sundial as the sun moves across the sky, or letting an afternoon thunderstorm bring rain into the building to flow out through drains in the floor. The building was a masterpiece of innovation and fresh ideas. The Pantheon was later restored by Antoninus Pius, then by Septimius Severus and his son Caracalla in 202 AD. 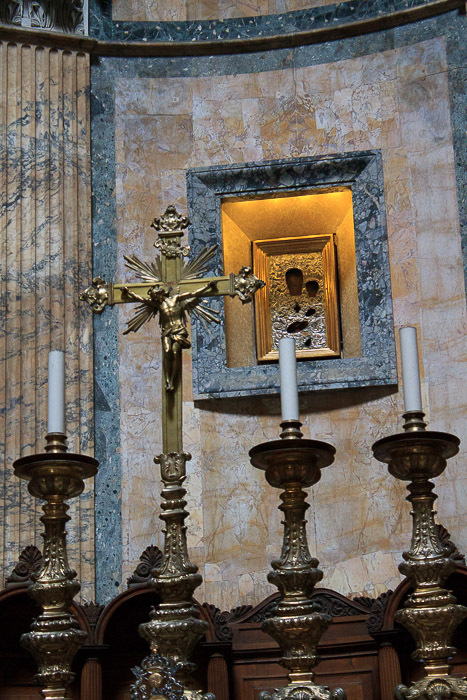 The eastern emperor Phocas donated the Pantheon to Pope Boniface IV in 608 AD, and it became a Christian church on May 13, 609 AD, after the "pagan filth was removed". On that day, the emperor donated the gold icon of the Madonna and Child which still is displayed above the apse (1st photo below). The Pantheon remains a church to this day. The church is officially named Santa Maria dei Martiri (St. Mary and the Martyrs), but is informally known as "Santa Maria della Rotunda". 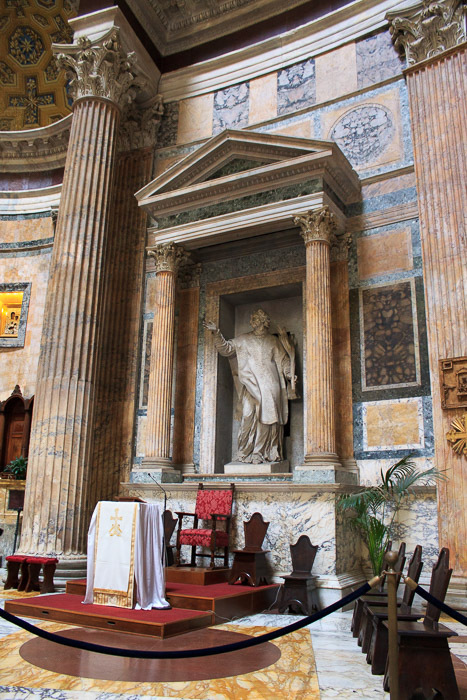 This conversion into a church saved the Pantheon from the abandonment and the worst of the spoliation that befell most of ancient Rome's buildings during the early medieval period, however some spoliation still occurred. For example, Emperor Constans II stripped the bronze tiles from the roof during a 12-day visit in July of 663 AD. He sent them off to his capitol city, Constantinople. Pope Gregory III had the roof reclad with lead in 735 AD. Marble was removed from the exterior of the building. Capitals from some of the ornamental columns are in the British Museum. The sculptures on the top of the porch's pediment above the inscription to Agrippa have been lost. Three columns were lost from the left side of the porch during the destruction of medieval buildings that abutted the east side of the Pantheon. Pope Urban VIII (1623-1644) replaced the front one, but he also removed the bronze ceiling of the porch, continuing the spoliation. Rumor states this bronze was used by Bernini for the Baldacchino of St. Peter's Basilica, but this is not true; it was really used for 80 cannons at Castel Sant'Angelo. The other two missing columns on the left side were replaced by Pope Alexander VII (1657-1667) with columns found near San Luigi dei Francesi which were originally from baths built by Alexander Severus. It is easy to see the three mismatched Corinthian capitals on the left side columns, compared with the rest of the Corinthian capitals on the porch (2nd photo below, and first photo at top of page). 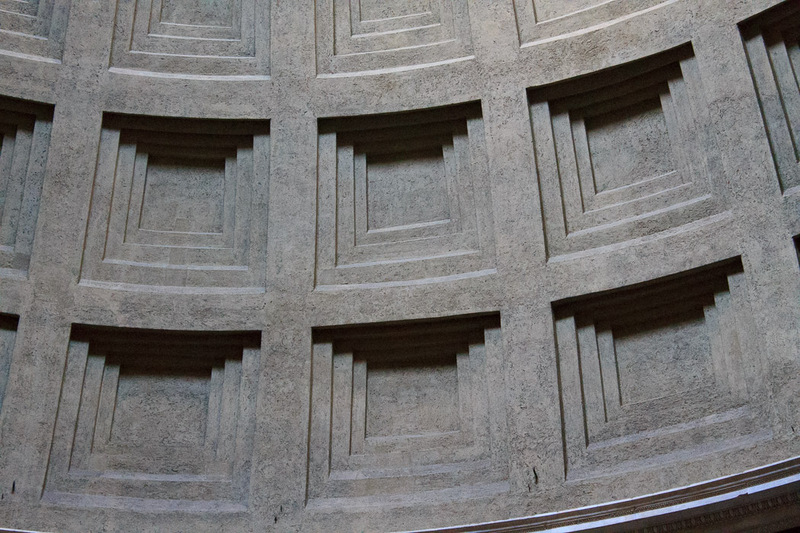 The wall of the Rotunda of the Pantheon has fifteen empty niches around the perimeter which, most likely, once held statues of Roman gods, heroes, or pagan symbols. Since the Remaissance the Pantheon has also been used as a tomb. 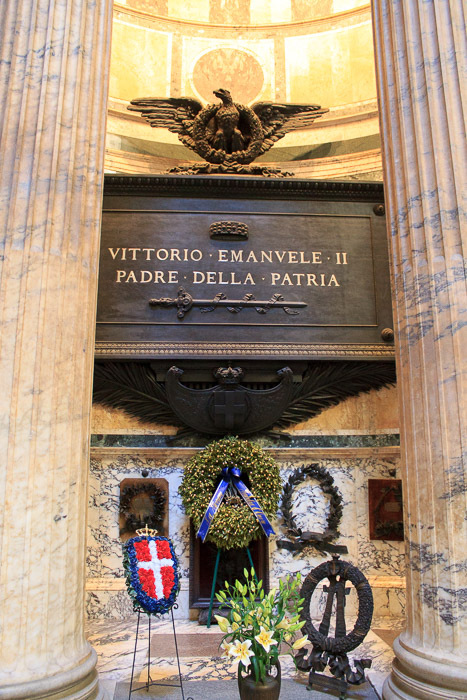 The painter Raphael, the composer Corelli, and two kings of Italy (Vittorio Emanuele II (1st photo below) and Umberto I) are entombed there, as well as Umberto's Queen, Margherita. The interior wall has niches and chapels framed by multi-colored marble columns in which are located these tombs, memorial portrait busts, and paintings. For the photo of the complete interior (3rd photo below), I stood in the center of the Pantheon, started photographing at the front door on the left edge of the photo, and rotated to my right until I reached the front door again on the right edge of the photo.